And with one of the most electrifying line-ups in tact, singer Stephen Christian, guitarist Joseph Milligan, bassist Deon Rexroat and protege drummer Nate Young were ready to take the world by storm; Furthermore their 2003 debut release, "Blueprints for the Black Market," was a perfect launch to do so. Instantly charming audiences with their incessant choruses, shredding guitar lines and sheer pop-perfection, the album immediately received critical acclaim, something Anberlin had no problem backing up on stage as they joined tours with bands like Fall Out Boy, My Chemical Romance, and Story of the Year. With two years, hundreds of tour dates and tens of thousands of copies of "Blueprints'" sold since then, Anberlin are eagerly poised for what's next. With time comes obvious maturity, something vocalist Stephen Christian doesn't shy away from. "I don't feel that we as Anberlin have evolved into something our fans won't recognize," Christian explains, "but I definitely think we have matured musically and broadened our listening tastes, coming into our own as a band." This evolution can be witnessed in full on their February 2005 full-length sophomore release, "Never Take Friendship Personal." Created with "Blueprints'" producer Aaron Sprinkle, who recorded their debut without ever seeing the band live, the obvious change of NTFP from its predecessor is that magic word: maturity. But after Sprinkle witnessed the band's live set for himself, something else was quick to change as well. "Never seeing us live, he never knew how intense we were," says Christian. "He realized that the second album had to reflect what he saw live - energy." The energy nearly leaps off the disc mere seconds into the first track as Milligan's guitar explodes through the opening riff, captivating the listener with bated breath. Each instrument and vocal delivery are not only dynamic, but filled with a real sense of confidence only experience could bring them. Even in diverse tracks like the ballad "Symphony of Blas'," Anberlin shine both individually and as a collective force. For a band that seems to have no problem creating hit songs, and joining some of the biggest tours in the country, success is almost expected. 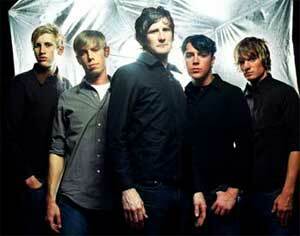 Still, it's one of the facets Anberlin have yet to fully come to terms with. "We are amazed at the reaction from the last album, " Christian elaborates. "It's crazy how many bigger bands in our genre know our music and love 'Blueprints'' Just tonight we were here in North Carolina and an older gentleman came up to me and we talked for a couple of minutes about bands and music. He went on to tell me that his son Adam had gotten him hooked on Anberlin and he had been a fan ever since. I learned after leaving the show that the man that I had met was Adam from Taking Back Sunday's dad!! I couldn't believe it! Adam got his dad hooked on our music!" And just as it had that first summer, the sparkle returns to Christian's eye, even brighter than before, but this time showing so much more than mere potential of a young band, more than the excitement of what "could be." This time there is a new confidence brewing, an excitement that is not only explosive but silently assuring their rise to the top.